We've got more reasons than a 6-pack (of Miller). Miller Park is going away, and I’m feeling some weird emotion at the intersection of sad, mad and disappointed. Upset, maybe. I’m upset. I’m upset because the name of the stadium of my favorite hometown team, one of the best if not the best stadium names in sports, soon will be no longer. MillerCoors’ naming rights deal, which runs through the 2020 season, is making way for a 15-year sponsorship with Madison-based American Family Insurance. The stadium’s new name will be announced later, but it’s a safe bet it’s not going to be Miller Park. Let us count the ways in which this will be the biggest loss the Brewers will take this year. 1) MillerCoors was the perfect sponsor for this stadium. Sure, the corporate headquarters is in Chicago, and big beer here isn’t what it once was, but more than 1,000 MillerCoors employees still work in Milwaukee. Those jobs are centered in Miller Valley, the ancestral home of a portion of the company that was the last big piece of the Milwaukee industry that gave the city its enduring identity. Home plate of the stadium bearing the name of this legacy company is located just a mile from its hive of beer activity. And beer and baseball just go together; millions of Miller beers have been quaffed inside Miller Park. There could be no more appropriate sponsor, period. 2) MillerCoors was the only sponsor for this stadium. 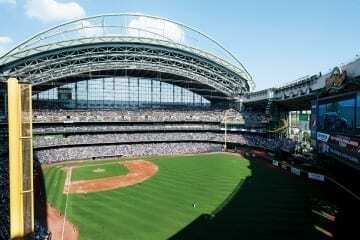 The Brewers and Miller Brewing Co. reached a $41 million deal on the stadium’s naming rights in 1996 – at the time, the biggest naming rights deal yet, so we’ve been conditioned for 22 years to call it Miller Park. I wasn’t thrilled about a relatively faceless naming sponsor for the Bucks’ new arena, but at least we weren’t calling it Harley-Davidson Forum for a generation before it became Fiserv Forum. 3) It’s arguably the least intrusive sponsored stadium name in sports. Corporate naming of sports venues has gone from something to be tolerated (sometimes awkwardly – remember Enron Field?) to a house of horrors in recent years (the White Sox’ Guaranteed Rate Field, the Cavs’ Quicken Loans Arena, the Pistons’ and Red Wings’ Little Caesars Arena). Miller is a corporate sponsor that also sounds like a last name, along the lines of classic names like Lambeau Field, Comiskey Park and Ebbets Field. Like the best sponsored names – Tropicana Field, Busch Stadium, Heinz Field and Ford Field among them – it’s a single word, and a national audience knows the company’s relationship to the community. 4) Many people like beer; nobody likes insurance. American Family and other insurance companies spend so much on advertising and celebrity sponsorship because they’re trying to convince you to pay for something you never want to use. It’s a costly abstraction until you need to use it, and then the company providing it usually adds to the bad day you’re having. Beer is the opposite of that in just about every way. Beer is good. 5) It makes me wonder how bad the financials are at MillerCoors. We know things are not great for big beer companies right now – MillerCoors announced it was cutting 350 jobs last fall – but I’m surprised a deal between the Brewers and MillerCoors couldn’t get done. The Brewers and its brewer partner knew all the common-sense reasons to extend the naming rights deal I’ve listed above. And I have to assume that American Family, with its army of actuaries and analysts, foresaw the intense backlash that’s unfolding now and will continue off and on until well after the first pitch of the 2021 season. The negative value of that aspect of the sponsorship is probably estimable, and would be baked into American Family’s offer price. We don’t know the amount of the final deal yet, but you’ve gotta think it was significantly more than what MillerCoors was willing to pay. 6) Madison is not Milwaukee. I mean, at least the insurance company has Wisconsin roots, not like Wal-Mart or Pepsi or State Farm. But I’ve lived in Milwaukee long enough to know that an awful lot of us think of Madison as its own place with its own people and its own agenda. It doesn’t soften the blow much if at all. 7) For many, the name’s not going to stick. My social media is a nearly endless stream of vows that “Miller Park” will live on, no matter what’s on the sign. We’ll see how long that holds, but a friend noted he still calls the White Sox stadium, “Comiskey Park or whatever it is now.” As WTMJ photojournalist Jeremy Dunk noted, the stadium’s address is on Miller Park Way. I have no idea what I’m going to call the renamed Miller Park. As an editor, I’m a rule follower when it comes to language and semantics, but “AmFam Field” is going to be a tough pill to swallow.